One of the tips that I often give to new bloggers is to post often. The more frequently you add new content, the more often readers will come to see what you’ve got. But this concept in blogging also poses a few problems. First, coming up with new posts and actually sitting down to research, write and format them is a lot of work. Second, unless you have email subscriptions set up - something I think all blogs should have! - readers are more likely to miss the posts that you work so hard to turn out. And even then, some of those emails might start piling up when readers get busy. I know I’ve missed quite a few posts from my favorite blogs of late. Sometimes, posting really great content just once in awhile can be a good thing. This is one of the things I love about Torque Story. This is a newer bead blog, written by the funny and talented Geneva, whose jewelry designs are delightful. Along with these gems, posts on Torque Story include lots of interesting insights into beading and jewelry making, craft fairs, color and inspiration. 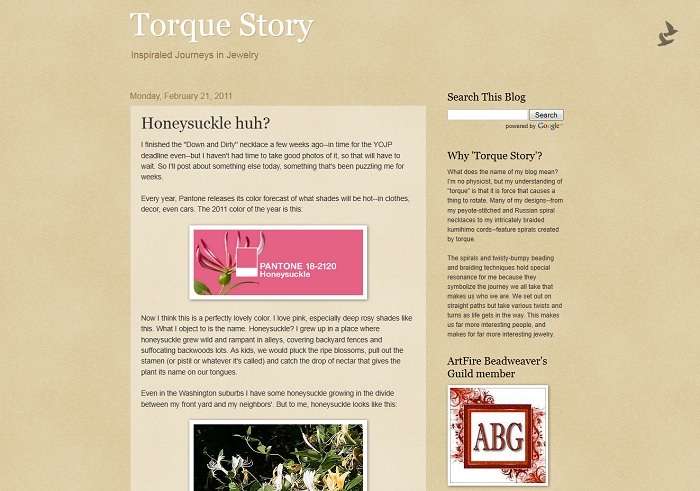 At Torque story, every post has a purpose - there’s no scrambling for content and no regurgitation. It’s a great place to catch some good beading vibes. Blog Spotlight is a special tribute to all of my wonderful readers. Featured blogs are chosen from the previous months comments. Thank you so much for reading Inspirational Beading! yay! I'm excited to check out those new (to me) blogs! thanks! Thanks for posting links to some blogs I had not found yet, will give them a look. Thank you so much for including my beading blog in your list of blogs! I will pay your kindness forward :D as always, thank you for your great tips!! Mortira, this is absolutely lovely as well as totally unexpected. This plug means the world to me. (I was wondering why I was suddenly getting comments to my blog from people I didn't know!) Now my challenge is to live up to your kind words. Thank you so much, Mortira, for mentioning my fledgling blog. I am both excited and nervous about being "out there." I was surprised you even knew I had a blog since it's that new! Anyway, thanks! Hey Mortira, Thanks for the links. Can't wait to check out these blogs. A little secret about me is that I am addicted to blogs. Ahhhh! thanks so much for featuring me!! I love all of these! So glad you pick out the good ones for us! Make it easy for them -- one should never forget that, regardsless of whether you want to get a costumer to buy your products or want to get loyal readers who return to your blog. And options like e-mail subscriptions do just that.